Click here for a list of all Festivals and Events in Paris. The European Council initiated European Heritage Days in 1991 based on a French idea dating back to 1983 (when the Ministry of Culture held its first historical-monument open days). 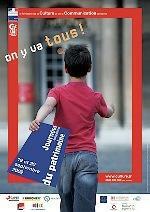 More than 40 regions in France now hold Heritage Days. The Palais de l’Elysée (the French President’s residence), Sénat, Assemblée Nationale, museums and theatres are a few of the many historical landmarks in Paris that open their doors to the public for this special weekend once a year. The city of Paris plays a very active role in this event. It maps out about 20 heritage trails for anyone who wants to explore this city on foot or by bicycle. The “Architecture Trails” (which you can read up on online) focus on the history of Paris’ buildings and architectural heritage around fountains and townhouses, quiet back streets and world-famous squares. Paris museums organise free-of-charge lecturer-guided tours and artist workshops. Permanent and temporary exhibitions are also free of charge during these two days. Check web site for more information about all the different venues and tours. The web site is only available in French.